Copywork is simply the copying of a text by hand. Copywork has many benefits. It provides students with excellent writing models and it gives opportunity to gain accuracy, work on spelling, learn proper sentence structure and more. 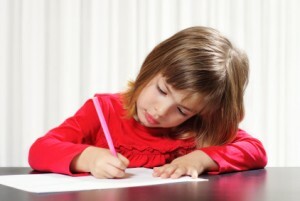 Copywork improves grammar, reading ability, dyslexia, handwriting, vocabulary, memory, and reasoning abilities. Perhaps the biggest benefit is the opportunity to discuss the material being copied. Often times we even end up digging for more information about the person or topic. “These words, which I command you today, shall be on your heart; and you shall teach them diligently to your children, and shall talk of them when you sit in your house, and when you walk by the way, and when you lie down, and when you rise up. You shall bind them for a sign on your hand, and they shall be for frontlets between your eyes. You shall write them on the door posts of your house, and on your gates” (Deuteronomy 6:6-9). “It shall be, when [the king of Israel] sits on the throne of his kingdom, that he shall write himself a copy of this law in a book, out of that which is before the priests the Levites. It shall be with him, and he shall read from it all the days of his life; that he may learn to fear Yevovah his God, to keep all the words of this law and these statutes, to do them; that his heart not be lifted up above his brothers, and that he not turn aside from the commandment, to the right hand, or to the left; to the end that he may prolong his days in his kingdom, he and his children, in the middle of Israel” (Deuteronomy 17:18-20). “But you are a chosen race, a royal priesthood, a holy nation, a people for God’s own possession, that you may proclaim the excellence of him who called you out of darkness into his marvelous light” (1 Peter 2:9). We are training up kings and queens in the service of the KING OF KINGS, who wants us to help build His kingdom. Copywork is much more than just handwriting practice! This is actually one of the most important subjects of your child’s day, because this is the time when YHWH’s Word enters his heart so that the Spirit of God can write His Torah on your child’s heart. “The entrance of your words gives light. It gives understanding to the simple” (Psalm 119:130). “For as the rain comes down and the snow from the sky, and doesn’t return there, but waters the earth, and makes it grow and bud, and gives seed to the sower and bread to the eater; so is my word that goes out of my mouth: it will not return to me void, but it will accomplish that which I please, and it will prosper in the thing I sent it to do” (Isaiah 55:10-11). If you have time for nothing else, do copywork! Are you inspired? I hope so! Our copywork books used the World English Bible, which is in the public domain and is based on the textus receptus (which is the same manuscript used for the King James and New King James versions of the Bible). 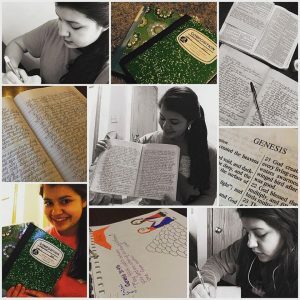 Throughout this curriculum, you will also see that we use a unique version of God’s name that isn’t visible in most English Bibles. The name “Yehovah” refers to the Creator of the Universe, our Heavenly Father. His name in Hebrew is spelled ְיְהוָ֗ה. In your English Bible, His name is translated as “the LORD.” Learn more about this topic at http://anneelliott.com/2015/11/pure-lips/. “For then I will restore to the peoples a pure language, that they all may call on the name of Yehovah, to serve Him with one accord” (Zephaniah 3:9, NKJV). 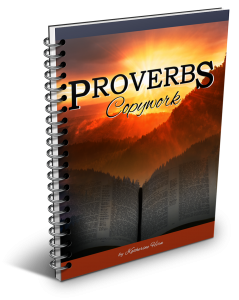 In this book, we will be copying the entire book of Proverbs from the Word of God. This text has been compiled by author Katherine Hirn, of http://hirnhomeschoolers.com. She has 15 children and was looking for a practical way to teach the book of Proverbs to them. This book is written for use with middle school level students. 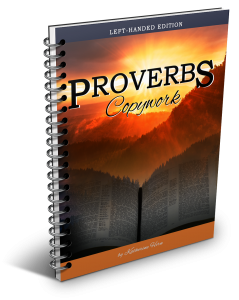 It is a 31-week copybook of the book of Proverbs with pages included for journaling and artwork. It could also be used by high school students or an adult as an intense daily copybook, which could be completed in one month (one week per day). 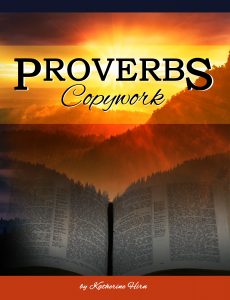 Each chapter of Proverbs is broken up into sections to copy daily, and on the last day of each week, the student is to journal and draw something about the chapter of Proverbs just copied.